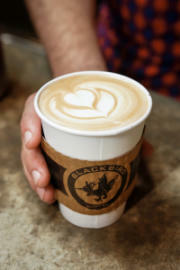 Perhaps one of the best parts of Blackbird Coffee’s downtown presence is the smell of the beans roasting. It’s an irresistible aroma and a subtle reminder of the joy that comes from slow-roasted, hand-poured coffee. From subtle to dark roasts and from giant chocolate chip cookies to scones, Blackbird has something for coffee aficionados, casual drinkers, and those with incurable mid-morning munchies. a, Colombia Excelso, Mexico Altura, Ethiopia Sidamo, and Guatemala Hue Hue Tenango. The “head roaster” roasts 24 to 28 pounds of coffee at a time. Typically, the Brazilian and Mexican beans are roasted lighter, the Colombian darker, and the Guatemalan and Ethiopian fall in the middle as medium-dark brews. Consequently, the Guatemalan and Ethiopian are found to be the most popular among customers. Guatemala Hue Hue Tenango – One of the more common brews, the Guatemala Hue Hue Tenango is a medium, nutty and smooth roast with hints of the bittersweet taste of dark chocolate. Ethiopia Sidamo – Maybe the most requested roast, Ethiopia Sidamo is one of the rarer batches to find brewed on any given morning – but that just makes it all the more special. With unique and fruity notes of blueberry, this medium-dark roast is the favorite of baristas and customers alike. It’s so sweet on the taste buds that typical “room for cream” drinkers are sipping it black. Apple Cinnamon Scone – Ask for an apple cinnamon scone at Blackbird, and your barista will answer with, “do you want that warmed up?” The correct answer is always, “yes.” Whether it’s a 60 degree morning or an 80 degree afternoon, there’s never a wrong time for a warm scone. With a crunchy outer layer and a soft and decadent inside with bits of apple and a perfectly portioned amount of cinnamon, this is a highly recommended sweet treat for when you’re feeling non-chocolate. Chocolate-filled Croissant – The chocolate-filled croissant is Milledgeville’s take on a French favorite. Flaky and buttery outside layers encompass a rich spread of chocolate. It’s a flawless balance of light and decadent that pairs well with a cup of in-house roasted coffee. 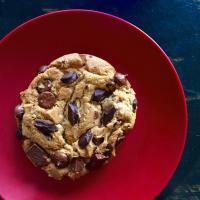 Giant Chocolate Chip Cookie – The name says it all. It’s a cookie…with chocolate chips…and it’s giant. It’s the definite choice for a sharable treat, but there’s no shame in enjoying it all yourself. Baked fresh on-site every morning, the chocolate chip cookie is a classic that can be paired with a Honey Nut Soy, Chai Latte, hot tea, or a black coffee – the possibilities are close to endless. Get it warmed slightly to give the chocolate the perfect amount of melt, and let your taste buds take it from there. A staple of the downtown scene, a trip to Milledgeville isn’t complete without a visit (or two or three) to Blackbird Coffee. Whether you’re there for a morning wake up call, afternoon pick-me-up, or to wind-down your evening, The Bird is roasting up something good Monday through Saturday from 7AM to 10PM, and Sunday from 8AM to 8PM.